By the mid-1990s Ryman had long been an internationally recognized painter. In 1993 he had a retrospective at the Tate Gallery in London that traveled to Madrid and the United States, and it was during this mature period of his career that he created the Part paintings. The lightly inflected oil paint surface of PART 12 (1993; fig. 1), a work from this series, was rolled on and then carefully brushed to build up its velvety texture. The piece is bordered by Ryman’s idiosyncratic brush-wide stroke of white paint, with stripes of blue and light brown paint on the left side, running perpendicular to the corrugated board’s grain. At first it seems that he used the white paint to mark off the space of interest, signaling the boundary of the art piece. 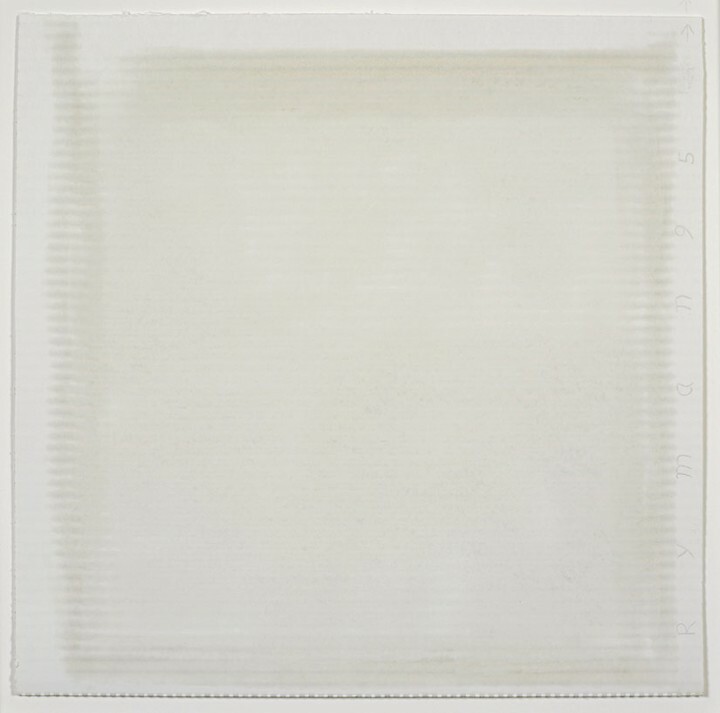 But the leftmost section extends the activated field beyond its perceived limit, making clear the insufficiency of the white “frame.” It is almost as if some paint has escaped through the small opening that the artist left in the upper corner, indicating that this white shape is a porous membrane, not a binding perimeter. When Ryman created Core XII in 1995 (fig. 2), he was exploring many of the same strategies that he had pursued in PART 12 but through variant iterations. The work—created with encaustic, pencil, and crayon on cardboard—has a similarly open-ended white boundary, defining a nuanced surface space. But the marks are less discrete: the materials are blurred and shift in gradation. Instead of differentiating, they implicate. The effect is unctuous, almost as if the cardboard holds the imprint of oily skin or has yellowed, its distinctions faded by age. The undulating chromatic spectrum of the work is brought to a halt at the meeting of the nuanced surface and the gallery wall, as Ryman contrasts the ambiguousness of his creation and the clinically regulated surface on which it is hung. Ryman’s attentiveness to boundaries has been present in his practice from the beginning. As early as 1961, in his untitled drawing of that year (fig. 3), his interest in delineating space is apparent. The pencil and gouache work at first seems markedly different from the later cardboard pieces since it has neither white outline nor regular surface and is filled with tight and chaotic marks reminiscent of the graffiti-like work of Cy Twombly. The square thick with gouache at the center of the composition is not simply a surface for the pencil marks but is instead intertwined with them, obfuscating some lines and highlighting others; every layer of the process remains visible. Ryman has carefully gridded this central square, with no effort to regulate the stray marks that reach beyond its outline. 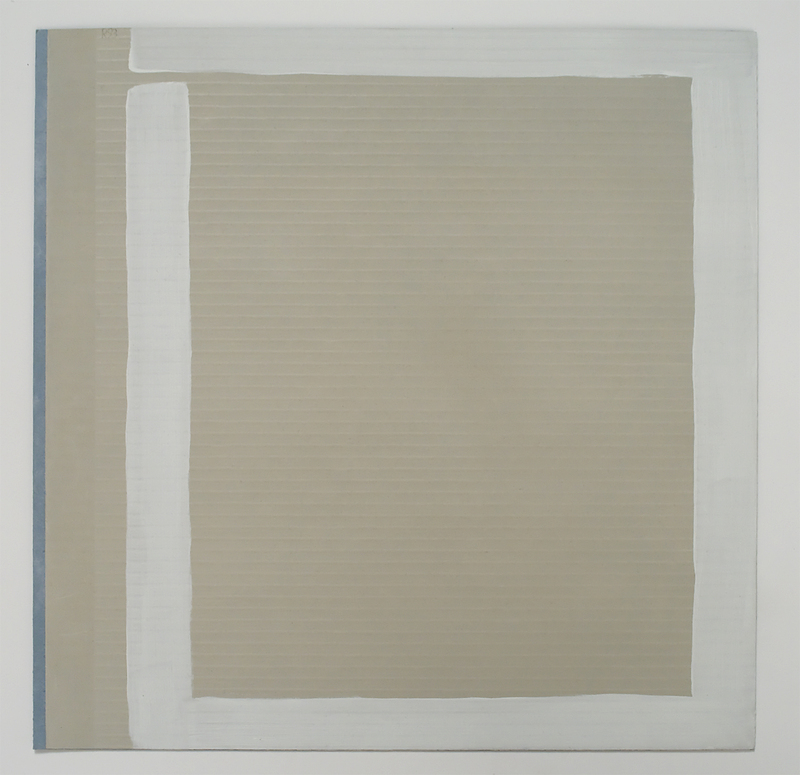 The white field does not fully extend to the edges of the square but is cushioned by ample room between its outline and the limits of the wove paper. Here the artist makes patently clear the negotiation between the composed arrangement and its exhibition backdrop by exaggerating the border between the two, thereby replicating and complicating the figure-ground relationship. Ryman’s signature serves as a cartographic key to all these works. Instead of following the convention of signing “over” a painting, his autograph is site-specific, transforming itself into an integral component of each composition. PART 12 includes a reticent “R93” inscribed at the top left, Core XII features a bold “Ryman 95” along the right edge, and the untitled drawing contains initials discreetly tucked to one side of the central square. These signatures work within or push against the artist’s delineations and borders. Ryman creates boundaries only to complicate them; he marks off spaces to highlight the arbitrariness of the markings. This process of careful circumscription undergirds the entirety of his practice, which continues as a systematic exploration of the consequences of even the lightest mark. 1. Robert Ryman, interviewed by Robert Storr (October 17, 1986), in Abstrakte Malerei aus Amerika und Europa / Abstract Painting of America and Europe, ed. Rosemarie Schwarzwalder (Vienna: Galerie nächst St. Stephan; Klagenfurt, Austria: Ritter, 1988), 213. 2. As Suzanne Hudson writes, “Ryman excises variables to allow for subtle modifications and shifts of emphasis—as given, for instance, by the choice of matte or glossy paint, a flat or rounded brush, a canvas or a linen support of differing weight, grain, tooth, and absorbency—and fosters innovations from work to work or even across the zones of a single painting.” Suzanne Hudson, Robert Ryman: Used Paint (Cambridge, MA: MIT Press, 2009), 107. 3. For more on Ryman’s interest in the painting’s edge, see Volker Adolphs, “Boundary” (2000), in Robert Ryman: Critical Texts since 1967, ed. Vittorio Colaizzi and Karsten Schubert (London: Ridinghouse, 2009), 331–34. 4. 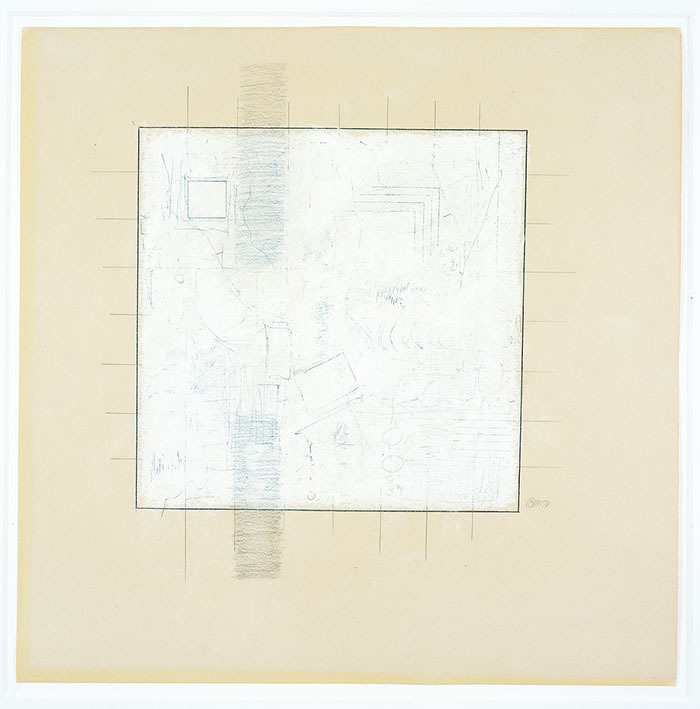 “Installation Information for Robert Ryman ‘Part Paintings,’” Pace Gallery; courtesy the aboutdrawing.org archives. 5. Ryman, interviewed by Storr, 217. 6. Because of its fragility, this work is now displayed in a frame instead of directly on the wall as Ryman originally intended. Kristen Gaylord earned her BA in English Literature and Art History from Westmont College, and her MA in Art History and Archaeology from the Institute of Fine Arts at New York University. She is currently a PhD candidate at the IFA, focusing on postwar American art. She has worked at The Museum of Modern Art and the Willem de Kooning Foundation, and is an editor of the Contemporary Art Consortium blog. Robert Ryman (b. 1930, Nashville, Tennessee) studied at the Tennessee Polytechnic Institute from 1949 to 1950. His most recent solo exhibitions have been held at The Menil Collection, Houston, Texas (2008); Hallen für neue Kunst, Schaffhausen, Switzerland (2010); Yvon Lambert, New York (2009); Dia: Beacon Riggio Galleries, Beacon, New York (2010); PaceWildenstein, New York (2010); and The Phillips Collection, Washington, DC (2010). His most recent group exhibitions have been held at the Ackland Art Museum, University of North Carolina, Chapel Hill, North Carolina (2008); Gagosian Gallery, New York (2009); the Museum of Contemporary Art, Los Angeles (2010); The Art Institute of Chicago, Chicago (2010, 2011); Museo Thyssen-Bornemisza, Madrid (2010); The Museum of Modern Art, New York (2011); the National Academy Museum, New York (2012); and the Brooklyn Museum, Brooklyn, New York (2012). Ryman’s work is in the public collections of The Museum of Modern Art, New York; the Solomon R. Guggenheim Museum, New York; the Tate Gallery, London; the Museum of Fine Arts, Boston; Stedelijk Museum, Amsterdam; the Philadelphia Museum of Art, Philadelphia; and the Whitney Museum of American Art, New York. Robert Ryman, interviewed by Robert Storr (October 17, 1986), in Abstrakte Malerei aus Amerika und Europa / Abstract Painting of America and Europe, ed. Rosemarie Schwarzwalder (Vienna: Galerie nächst St. Stephan; Klagenfurt, Austria: Ritter, 1988), 213. As Suzanne Hudson writes, “Ryman excises variables to allow for subtle modifications and shifts of emphasis—as given, for instance, by the choice of matte or glossy paint, a flat or rounded brush, a canvas or a linen support of differing weight, grain, tooth, and absorbency—and fosters innovations from work to work or even across the zones of a single painting.” Suzanne Hudson, Robert Ryman: Used Paint (Cambridge, MA: MIT Press, 2009), 107. For more on Ryman’s interest in the painting’s edge, see Volker Adolphs, “Boundary” (2000), in Robert Ryman: Critical Texts since 1967, ed. Vittorio Colaizzi and Karsten Schubert (London: Ridinghouse, 2009), 331–34. “Installation Information for Robert Ryman ‘Part Paintings,’” Pace Gallery; courtesy the aboutdrawing.org archives. Ryman, interviewed by Storr, 217. Because of its fragility, this work is now displayed in a frame instead of directly on the wall as Ryman originally intended. All written content © 2019 by the authors. Concept and coding © 2019 by the Fifth Floor Foundation. Design by Yasmin Khan. Based on a parent theme by Graph Paper Press.